Japanese superstar Hideki Matsuyama will make his first appearance at a regular European Tour tournament when the World Number Four tees it up at the Dubai Duty Free Irish Open hosted by the Rory Foundation from July 6-9. The 25 year old has become one of the hottest properties in the game thanks to his scintillating form since May of last year which has yielded three victories on the US PGA Tour, including at the WGC-HSBC Champions in Shanghai, and two runner-up finishes. 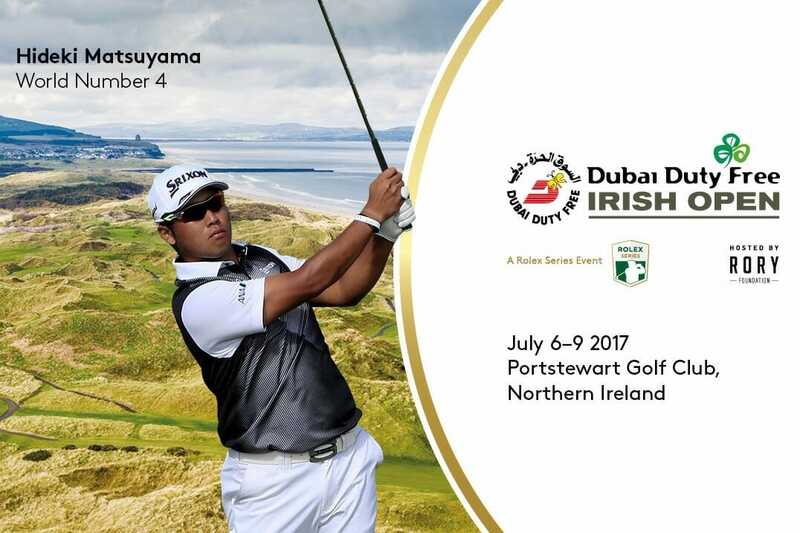 The Dubai Duty Free Irish Open, the third Rolex Series event of the 2017 Race to Dubai, will feature a record $7 million prize fund when it takes places at Portstewart Golf Club for the first time this year, with golf fans able to purchase their tickets here to witness Matsuyama in action. Matsuyama’s maiden appearance at the island of Ireland’s national championship – alongside a plethora of the game’s biggest names such as McIlroy, Jon Rahm, Justin Rose, Tyrrell Hatton, Danny Willett and many more – provides another significant boost to what is already expected to be the biggest in the tournament’s long history. Matsuyama’s eye-catching record at the Major Championships has been another factor in his rise to such heady heights in the Official World Golf Ranking – with American Dustin Johnson, Dubai Duty Free Irish Open tournament host Rory McIlroy and Australian Jason Day the only players above him. In his last seven appearances in golf’s big four, he has claimed three top tens and two more top 20 finishes, while he also finished in the top ten at both The Open Championship and US Open Championship back in his first year as a professional back in 2013. Matsuyama, the third player in the current top ten in the world to be announced for the Dubai Duty Free Irish Open thus far – following McIlroy and Rahm – said: “I am really looking forward to playing the Dubai Duty Free Irish Open for the first time – I have heard great things about the tournament and about the Northern Irish fans. Matsuyama’s compatriot Hideto Tanihara has also confirmed his participation at Portstewart, with the World Number 48 making his debut at the event having finished in a share of third at the very first Rolex Series event – the BMW PGA Championship – two weeks ago. Official Hospitality packages are also available on the ticketing page, or alternatively contact the European Tour’s dedicated Hospitality Sales Team, who will be happy to answer any queries and discuss the various hospitality options, on enquiries@europeantourhospitality.com or +44 (0)1344 840681.